You know how annoying it is to take off your warm gloves to check the message you have just received when it’s freezing cold outside? So why not find the best touchscreen gloves for you and keep those hands warm even when you are using your phone. You have a whole bunch to choose from, either thermal ones that let you use your phone while you are hiking up the mountain or more stylish ones for the more urban environment. Maybe you want a thinner glove or prefer the classic look of leather? No matter your choice, there are the right pair of touchscreen gloves for you out there. What is a Touchscreen Glove? 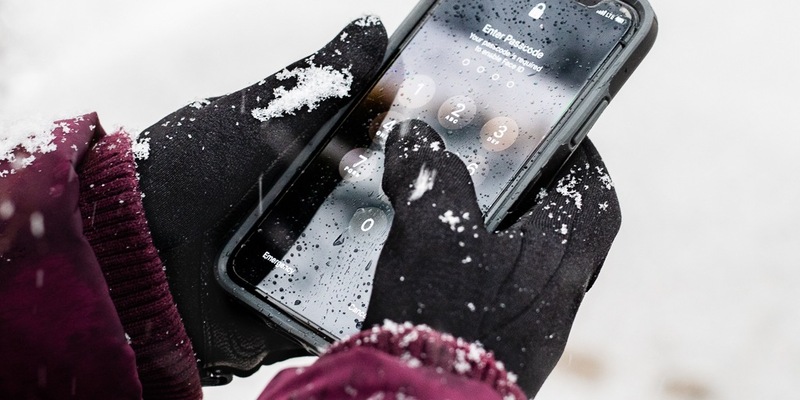 Texting gloves, touchscreen gloves or capacitive touchscreen gloves let you use your smartphone while protecting your hands from the cold weather. They are made from a conductive material with a low resistance when it transfers electricity from your fingertips to the phone screen. This means that you can use the touchscreen through the material. Why Can’t I Use My Phone With Gloves On? If you have a smartphone that was manufactured in the last few years, then it has a capacitive touchscreen. This means that it can register movements by picking up on fluctuations on the screen’s electrical field. The skin is able to deliver these electrical impulses directly to touchscreens, but most fabrics are not able to. In our opinion, these are the best touchscreen winter gloves from the ones we have tested. They hug your hands like a second skin, making typing on your phone much easier and more accurate. The fleece material also blocks out the cold and wind better than traditional knit fabrics. It is also water-repellent, so they will perfectly dry in less than two hours. Because they have been designed to be liner gloves, they are not very warm. They work better with an outer glove or on their own when you are active outdoors. The fact that the material is stretchy means it is more forgiving than with other gloves. These are the best women’s touchscreen gloves because they have shorter fingers compared to other gloves. Most people with shorter fingers have problems finding gloves that fit them. Moshi Digits Touchscreen Gloves fit tightly thanks to their knit design and the microfleece lining is soft and cozy. Not only is typing easy with these gloves, but they are also warmer compared to others. They have a better grip and dry faster than other knit gloves. Because they are available in only two sizes, they are not an option for those with longer fingers or very large hands. If you live in an area where temperatures drop below 40 °F, the Glider Gloves Urban Style Touchscreen Gloves would be a good choice. 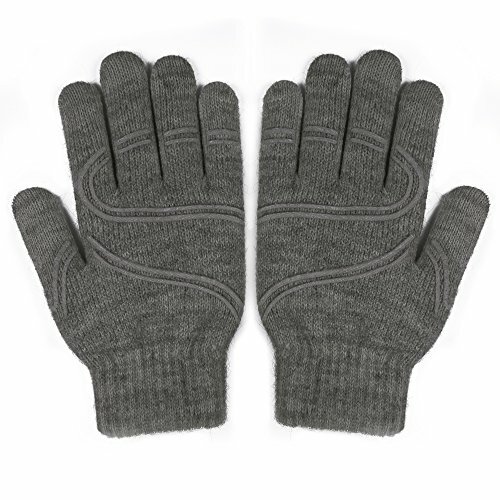 They are less insulated, but more appropriate as touchscreen work gloves for those in a cold office and want something thin for all-day use. Some of the warmest touchscreen gloves are the Kent Wang Deerskin Gloves. These fancy leather gloves have above-average touchscreen accuracy, classic design and cashmere lining. They are warmer compared to other gloves, even premium ones. On the downside, these gloves are quite expensive, and they are sold only in five sizes. These thermal touchscreen gloves are the top of our list because they’re easier for typing compared to other gloves, fit a large variety of hand sizes and are warm enough to use in winter. They are manufactured by aa outdoor product manufacturer, so this means it will be quite easy to find them stocked in the stores in the cold season. These gloves have ranked in the top for being the most accurate when texting and the fleece material that stretches offers the best dexterity making typing easier. The glove’s fingers are capacitive, but it’s best to use your the index fingers. When it comes to typing, these gloves required less pressure on the touchscreen and fewer mistakes were made when typing compared to other gloves. The gloves are ok for texting, but they do not keep the hands very warm. They are recommended for temperatures between -25 °F and – 40 °F and you can wear them with an outer glove. Although the elastic cuffs can prevent air from getting into the gloves, the fingers can still get cold. They are better at fighting off the cold when you are active, being perfect for skiing, hiking or trail running. Some of those who tested them said that the gloves kept them quite warm when they ran errands, but their fingertips got cold while they waited for the bus. Another good thing about this product is that the gloves dry out quickly, meaning about two hours if you get them soaking wet. The durable and water resistant coating does all the magic. 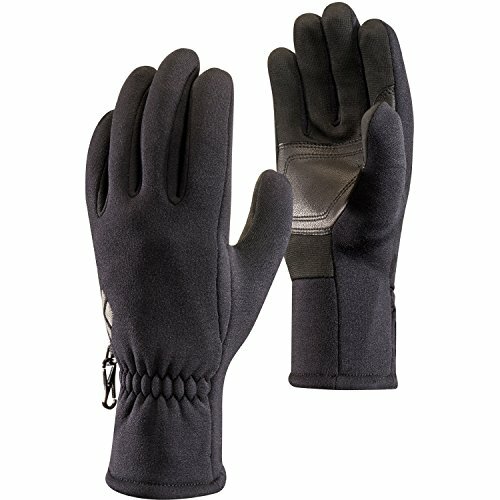 These gloves also fit most hand sizes and shapes thanks largely to the fleece shell that stretches to offer just enough give not to feel loose and enough snug in the fingers. The stretchy material also makes the gloves perfect for those with longer fingers. The Black Diamonds are available in black only, and they are about function, not fashion. They just have a little Black Diamond logo and that’s the only branding you will see. They also have a big patch of leather on the palm which helps when trying to grip metal railings and slippery phones. The gloves have a small clasp so you can connect them and make them stay together in your bag. You can choose from the LightWeight, MidWeight and HeavyWeight options depending on your needs. These are the best women’s touchscreen gloves but can also be worn by men with shorter fingers. They are cozy to wear, and they type really well, but they come only in two sizes. They have a knitwear pattern that is tight yet flexible, making them great for dexterity, but they are also thin enough on the fingertips, helping tremendously while typing. This is what makes the ttyping more reliable than with most other gloves. Conductive fiber is sewn in all fingers, so you can even use your thumbs to type. These are the coziest and warmest gloves from the ones we tested. They are lined with microfleece and have a knitted exterior. They even keep you warm even when you walk the dog for 15 minutes. Although made of knitted material, these gloves are not to bad drying out. It took only one hour to dry them, compared to up to 4 hours for other knitted gloves. The gloves have rubberized grip lines and dots to help you your phone firmly in the hand. Although the fingers are about an 40mm shorter than most other gloves, this product is perfect for those with short hands and fingers. On the downside, the gloves’ knit construction catches on Velcro easily causing general fuzziness. Thin, accurate, with great conductivity, these are the top of the texting gloves. But because they are so thin, they are not such a good option for very cold winters. These gloves have conductive copper yarn interwoven, which means that the whole of the glove is touchscreen compatible. They are less resistant to the wind because they are single-layer knitted and they are not warm enough once your into the low 40s F.
Glider Gloves Urban Style fit is a little loose so it would be better to choose one size down. Because they are the thinnest among those tested, they do not trap heat from your body as well as other options. The company says the loose fit is what customers wanted and that they contain 2% spandex material that in time will shape to your hand over time. The fact that they have low insulation, makes them perfect for people who want to wear gloves all day but need more dexterity, for example in a cold office. On the downside, the gloves take very long to dry, about five hours. But they are still a good buy if you live in a warmer climate or use them in the cold for a short period of time. The gloves’ design is simple, black and olive green lines with stripes. A cluster of little silicone honeycomb hexagonal holes covers the palm and fingers to prevent slippery objects from slipping fromyour grasp. The fact that these gloves are thin, makes them easier to roll into a ball and quickly throw them in the bag. The last but not the least are the more refined leather touchscreen gloves, Kent Wang Deerskin. If you want the feel and look of the all leather gloves, but still keep the touchscreen compatibility, then these are for you. They are lined with cashmere, but unfortunately will not keep you warm enough in super cold climates. These gloves have the whole surface touchscreen compatible and they performed better when typing compared to the other leather touchscreen gloves during testing. The thick seam on the fingers will prevent you from using the sides or tips to swipe or type. Instead you have to use the finger pads which can be a little uncomfortable. The gloves don’t keep very warm, and you might even feel colder faster in these than in fabric gloves. On the good side, the deerskin keeps moisture away and prevents water staining better than other gloves. Also, don’t worry that they will take a lot of time to dry, because they do not get wet! 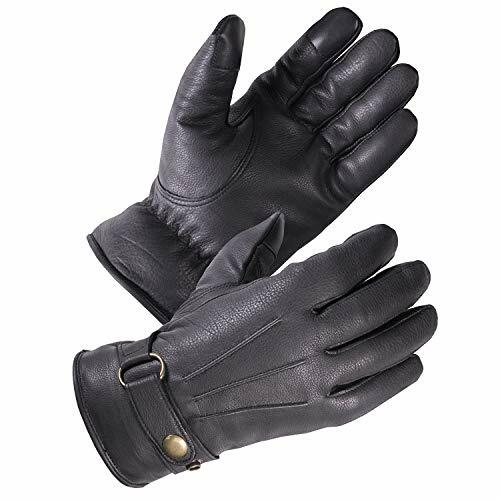 The Kent Wang Deerskin Gloves fit really good on the hands with a more give in the palms and knuckles than other leather gloves. This helps a lot when you are typing. The gloves are have an adjustable pull strap with button to enhance good fitting. They are made of deerskin and calf leather with a classic design. They do not look techy, as the conductive materials is infused into the leather and the cashmere lining is nice and soft. Although the gloves are sold in different sizes from S to XL, it’s harder to get the right fit if you are between sizes. Who Should Buy Thermal Touchscreen Gloves? Anyone who wants to use his smartwatch or capacitive screen device when it is cold outside, should wear touchscreen gloves. So why take your glove off to use your phone when you can use texting gloves? On the downside, touchscreen gloves are not good at keeping warm. The most accurate gloves are usually thin, which means they will leave you freezing in cold weather. How Do These Gloves Really Work? A capacitive touchscreen has to be touched with something that conducts electricity, such as a stylus or your finger. Touchscreen gloves have special materials to achieve the same effect. The first touchscreen gloves had patches of conductive material sewn into the fingertips. But these gloves wear out quickly. The latest method is to weave conductive thread, usually copper or silver, into the fabric, throughout the glove or just in the fingertips. This thread would conduct electricity from the finger to the tip of the glove covering that finger. Another way would be used in leather gloves, embedded them with nanoparticles of silver, to produce full-hand conductivity. This method is more forgiving of a loose fit compared to knit gloves with conductive thread, as the leather is able to conduct electricity from any area of your hand to any fingertip. Can You Wash Touchscreen Gloves? If you’re wondering ‘How do you clean touchscreen gloves?’, here is some advice that will help you keep your gloves as new for as long as possible. When they get dirty, gently wash them in cold water using very mild soap or cleaning products. Lie them flat to dry in a well ventilated area. It took us several year and hundreds of gloves to test to be able to pick the best ones for you. We also took into consideration the companies with the best reputation, availability across major retailers, strong owner reviews, and a wide variety of styles and fits. What we observed, is that heavy-duty gloves are not good for typing, but they keep warm, and the thinnest gloves are good for typing but won’t keep your hands warm. So, we focused on those in the middle, gloves that are warm enough to get you through a commute. What we took into consideration was fit, accuracy, comfort and appearance and we tested all these at freezing cold temperature. We also tested the drying time and durability. 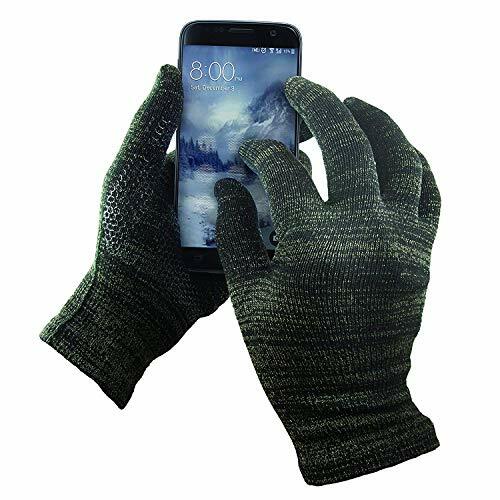 Touchscreen gloves are a great purchase and they can keep your hands warm in the cold season while you use your phone. They are one of the greatest inventions with the purpose of making our lives easier and more comfortable. Choose from the best touchscreen gloves the right ones for you.